I haven’t as yet decided to how to index this little experiment. 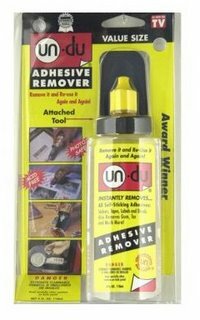 Un-Du adhesive remover has been pointed out as an alternative adhesive remover to my personal favorite Ronsonol Lighter fluid. I picked up a 4 oz bottle at A.C. Moore craft store today. How come whenever I pop in there for ONE thing, I always come out with five things I didn’t know existed? I have absolutely no interest in the scrapbooking fad, but it has inspired a flood of useful little gadgets. As with most proprietary products, the makers are ultra secretive about the active ingredient, but my reseach tells me it is either heptane or hexane, which is an alkane (a paraffin up there with butane, octane and propane.) So, we still aren’t in the non-toxic category, but it does smell less foul than naptha. For removing an acrylic based adhesive sticker, I didn’t notice much difference in speed or effectiveness than lighter fluid. But it DID work and speedily enough, and left the same amount of residue on the original surface. A 4 ounce bottle costs about the same as an 8 ounce Rosonol. I would recommend it to anyone odor sensitive. But basically it couldn’t hurt to add it to your tool box if you see it.